The Queen's official birthday celebration (held apart from her actual April birthday, for better weather) is marked with the sovereign's annual birthday parade, also known as Trooping the Colour. This is held annually on a Saturday in June, and the Queen has attended every year of her reign except 1955, when it was cancelled because of a national rail strike. For the first few decades, she rode sidesaddle in uniform. 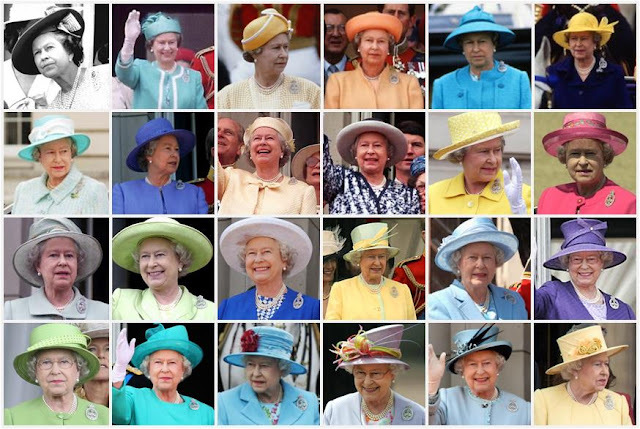 The Queen's uniforms most often included her Order of the Garter riband, star, and medals. She rode until 1986, which was the last year her horse Burmese (a gift from the Royal Canadian Mounted Police, and her trusty Trooping partner since 1969) was used. Burmese retired and so did the Queen; from 1987 on, she has typically ridden in a phaeton (open carriage) and has ceased wearing a military uniform. 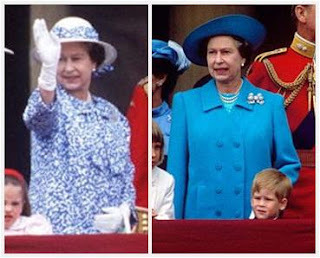 In 1987 she wore the Guards' Badge, one brooch to represent all five Household Regiments; in 1988, she wore the Dorset Bow Brooch. By 1989, she returned to the Guards' Badge and she has continued that tradition in every following year. 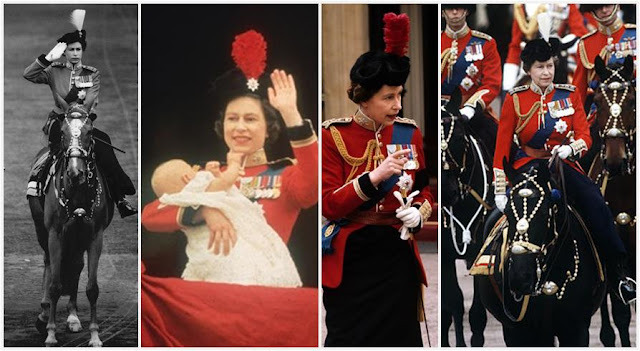 There are a few years at the beginning when the Queen combined the Guards' Badge with an individual regimental badge, but she soon stopped that practice and allowed the one large badge to cover all appropriate representation. Trooping the Colour is the one occasion each year for which the Guards' Badge is used. She naturally combines this with her standard button earrings and triple strand of pearls.